They’re for looking better too. In fact, some people who don’t even need vision correction wear tinted contact lenses as a way to change their look. Today’s tinted lenses allow you to enhance your natural eye color — making the blue bluer or the green greener — or change it altogether. 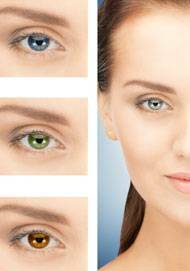 Opaque, or “cosmetic,” tints change the color of dark eyes. 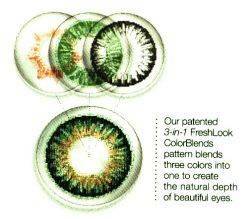 The pattern on the lens, which is colored, overlies the colored part of your eye. The result is a natural look. With tinted lenses you accomplish two goals at once: Seeing better and looking better. Contact lenses aren’t just for seeing better.